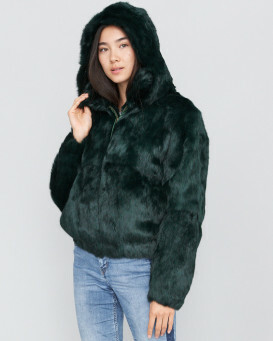 Attend a midnight masquerade in our Frances Black Rabbit Fur Bomber Jacket with Hood for women. 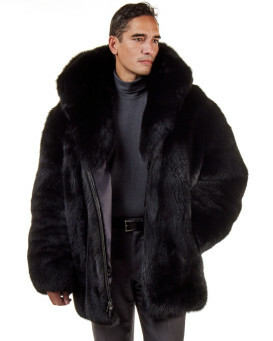 Genuine dyed black rabbit fur is plush on the body with a fully lined black rabbit fur collar and hood. The exterior features a durable front YKK zipper and two side entry pockets. The silky satin interior is crafted with an interior side pocket to keep your valuables discreet. An elasticized bottom hem creates a snug fit. This casual jacket looks great with khakis or jeans. 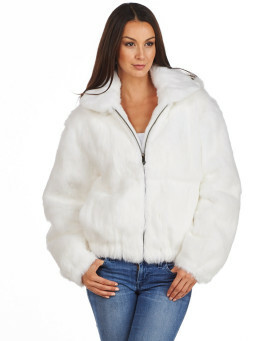 Available in sizes small to 4XL, you're sure to make a statement in this fashionable fur bomber jacket. "Hello! 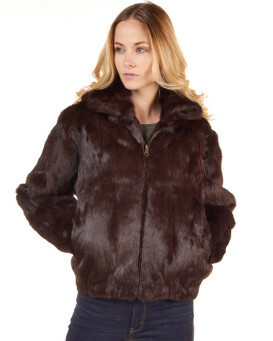 I would like to thank FurHatWorld for this beautiful Frances Black Fur Bomber jacket I purchased for my Wife. 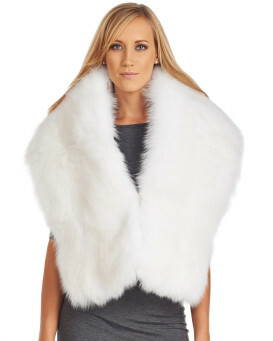 I've been looking for a Fur for my Wife for some time, everything I've seen has been too expensive. My co-worker found your site, and I'm glad she did. 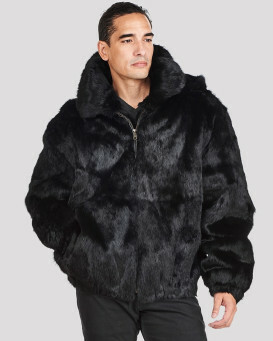 My wife is gonna love this jacket, and for the price I love it also!!! I'm gonna get one of these myself, so we can match when we step out somewhere special. Thank You FurHatWorld, now I gotta get some accessories!!!!" 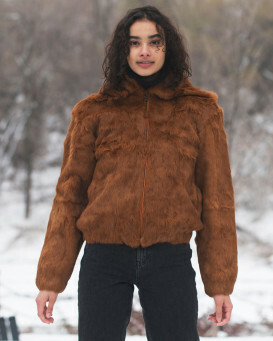 "this coat is beautiful; very soft and warm; I have wanted this coat and it has always been sold out.....now that I have one, I understand why. 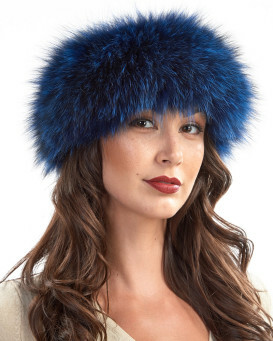 The only bad comment is that my mom can fit it and tried to wear it first....lol Thank you Fur Hat World!" 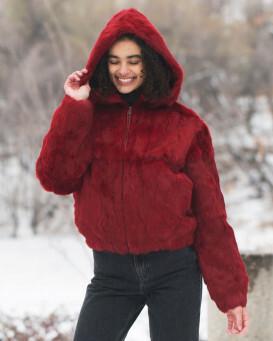 "Ordered the red rabbit fur bomber jacket with detachable hood and loved it! 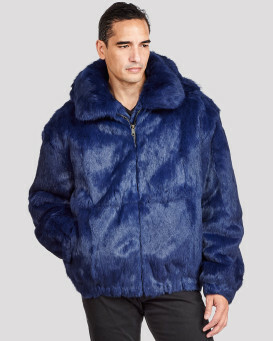 I loved it so much, I ordered the navy rabbit fur bomber jacket. I received many, many compliments. 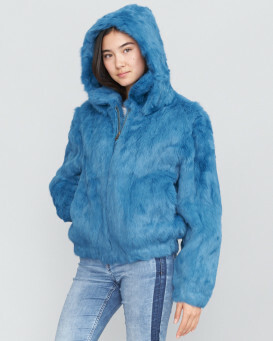 I could order this jacket in every color." "Received my Red Rabbit Bomber today OMG!!!! the color is georgeous, the picture does not do the jacket justice the red color is phenomenal. All I can say is OMG...if you never purchased anything from Furhatworld start wit the Red Bomber. Great for the weather that we are currently having in Georgia." "Nice, more casual look. The hoodie is lacking in structure and appeal.. I attached a black fox head band that I purchased from FURHAT WORLD, to the front of the hoodie... PERFECTION, looks more tailored and beautiful"
"This Bomber Jacket is gorgeous. It fits perfectly and I have received nice compliments while wearing it. 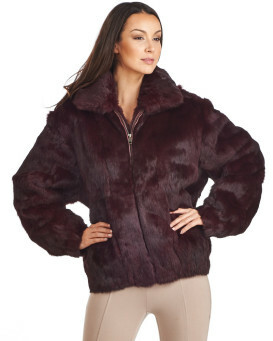 I will shop here again"
"I absolutely love my coat! Perfect fit, and material is made well, I'm a plus size woman and was worried it will look really puffy, but it fit beautifully! It was do nice my mom ordered the red one! And I'm buying my husband one for his birthday!" 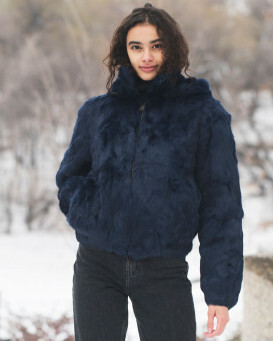 "I love the product,I bought my son and two daughters one , I know how great it feels to wear it in the cold it’s very warm inside,I can’t wait until it winter so my kids can wear theirs and see that great feeling it gives."